I have to make a confession here that I have never truly been a huge fan of Deacon Blue; my knowledge of the band’s music not really stretching much beyond the first two albums and the Bacharach & David EP. I had been compelled to check out those early albums, (Raintown and When The World Knows Your Name) by the clutch of really rather special singles they held, but once the hits dried up so did my attention, I’m afraid. That being said the heartbreakingly evocative Orphans has never been far from my MP3 player’s favourites list over the years. Wife has always been more of a fan, and she it was who suggested this gig, part of a tour to celebrate the 25th anniversary of the release of Raintown, may be a fun evening. We asked Daughter if she wished to come along, knowing Deacon Blue to be one of the bands she had unearthed and enjoyed when digging around in my MP3 player. But she seemed strangely reluctant. “It would feel freaky” she opined, only then us remembering she had in her school class an offspring of one of the band members. It plainly would be considered highly uncool to be discovered going along to see a classmates’ Dad in concert. But she relented when we assured her she was most unlikely to bump into anyone she knew. 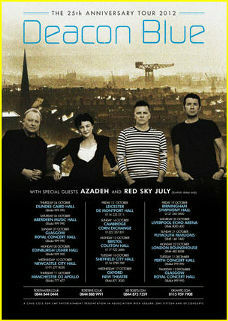 Deacon Blue opened their set with a new song, Here I Am In London Town. This a rather sparse composition, accompanied only by keyboards with Ricky Ross’ voice sounding particularly strong. The latest single, the remarkably catchy The Hipsters followed. And that really was the overriding impression I came away with from the gig – just how compelling the new songs were. This clearly was no wallowing in nostalgia exercise, and the band were confident enough in their new album to play a total of seven songs from it, all of which stood up well alongside the biggies. Indeed, I would opine the likes of Stars and That’s What We Can Do would not have appeared out of the place on the WTWKYN album. I was surprised that no mention was made of the new album; nor were any of the songs from it introduced. This despite the fact Ross clearly enjoys a deft line in witty banter: his Commonwealth Games tale a delight. But it was, of course, the classic singles from the late Eighties which stole the show: Chocolate Girl, Real Gone Kid, Fergus Sings The Blues and Dignity all had the place bouncing. Wages Day, I thought, disappointed a bit though. Perhaps the length of the show had taken its toll, but Ricky and Lorraine’s vocal performance at times veered more towards shouting than singing. Additionally, I personally would have liked Gregor Philp’s guitar to have been given a more prominent place in the mix throughout the evening. But these really were very minor blemishes. For a great night was had by all; including Daughter who, perhaps inevitably, bumped into her classmate as we left. I have never before seen her blush so deeply – her teenage street-cred blown forever. Is There No Way Back To You? *This was a medley of two different songs – the first Deacon Blue’s own composition, the second the one made famous by The Isley Brothers and The Beatles.